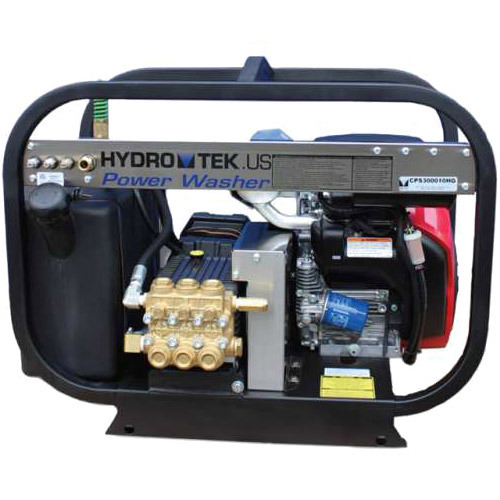 The Hydro Tek CPS Series Cold Water Pressure Washer is an industrial pressure washer with a gas engine. This pressure washer is versatile, full-featured, and a great choice for heavy duty cold-water pressure washers. The smooth running engine is equipped with pressure lubrication, oil filtration and a large fuel tank. The CPS Series is perfect for jobs requiring high pressure and high mobility: On-site equipment cleaning and auto-detailing, graffiti removal, paint preparation, moss and mildew removal from sidewalks and decks, wet sandblasting and more. This CPS Series cold water power washer is an excellent companion tool for the professional who wants performance and durability.